The ultimate guide to Iso-Syote ski holidays in 2019 & 2020. Surrounded by the stunning Syöte natural park with frozen lakes, snow-covered pines and activities like reindeer sleigh rides, this is a super place to ski if you want to a real winter wonderland experience. Iso Syöte is Finland’s southernmost fell and with the Syotekeskus and Iso Syote Fell ski areas joined in recent years, you can enjoy around 20km of highly acclaimed skiing. 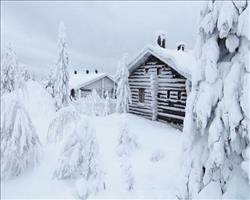 Iso Syote is Finland’s southernmost Fell at about 150km south of the Arctic Circle. In terms of getting here, Kuusamo is the nearest airport at 100km away, which is about a one hour transfer to the resort. The next nearest airports are Oulu (140km) and Rovaniemi (160km). If you are travelling by rail, the nearest train station is Oulu which has a bus connection to the resort. Day trips to Rovaniemi are possible if you want to visit Lapland’s capital – visit Santa’s village and even meet him, the elves and his reindeer. You can also visit the Arctic Zoo where you’ll meet polar bears, wolves and deer. There is the SnowWorld daycare centre for children near the main slopes, where little ones can learn to ski and meet live reindeer under the care of professional nannies. Hippula is another indoor childcare centre. View our detailed Iso-Syote snow forecast or snow report and see all live webcams, piste maps, road and travel maps and lift pass prices. For a picture of historic snow conditions see the snow depths month by month with our Iso-Syote snow history. The 2 ski areas (Syotekeskus and Iso Syote Fell) were joined in 1994 to make this one of the biggest ski centres in the country. 15 pistes and trails means approximately 1.2km of runs. The longest run is over 1.2km. The mountain has 0% beginner runs or nursery slopes, 33% intermediate, 40% advanced slopes and 26% for experts. There is no night skiing. SnowLand consists of 2 family trails with free lift access, served by a magic carpet, button lift and rope tow. The trails are lovely and wide for those setting out on their skiing career. You can sledge here and play in the playground and snow castle... and there’s usually a BBQ for hungry tummies. There are also 2 lovely long, wide runs for beginners. You’ll find freeride trails for experienced skiers as well as a mogul field and 3 long black runs. There are 120km of cross country trails. The Panorama restaurant in Hotel Iso Syote is one of the most popular eateries in the resort, with high quality dishes accompanied by amazing views of the surroundings. It’s attached to the Panorama Bar where you can enjoy live music and a disco that stays open into the early hours. The Snapsibaari shot bar has a DJ and regular theme and karaoke nights and is open Fridays and Saturdays in the winter season. We love the pizzas at Pärjänkievari (the steaks are super too). Club Legenda has something for adults and kids in the evenings with past seasons seeing events like candy bingo. 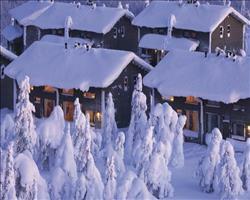 Snowmobile safaris depart from most hotels and offer a breathtaking ride through the pine forests. You can also take a husky or reindeer sleigh ride through the surroundings. When is the best time to ski Iso-Syote? 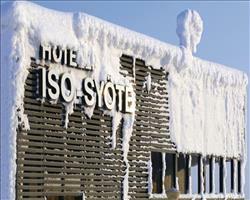 The direction which the various Iso-Syote slopes face can make or break your ski holiday. To guarantee good snow conditions, choose a resort with piste which face the right way for the time of year you're travelling. In the coldest winter months of January and February pick a resort with sunny south facing slopes, so your days on the snow doesn't feel like a polar expedition. Conversely, in the warmest spring skiing months of March and especially April, a resort with cool and shady north facing trails will ensure you're not riding on slush, but benefitting from best late season snow. The best destinations have areas which face in all directions so that you're guaranteed terrific conditions whatever the weather.